But before you run out the door here’s what I think about this new, and apparently, revolutionary product. The Micro Essence is only available in Asia for now so friends in the Western world will have to wait to see if you get it or if it never arrives. The reason I think it’s made for the Asian market is because of what it is – a treatment lotion that is something many of us who are familiar with Asian type skincare are familiar with. This isn’t a toner in the traditional sense. What this is is an essence in lotion that hydrates, calms and repairs the skin barrier amongst others. Those of us who are already familiar with Asian skincare will be familiar with how this works and I think the nod given by Estee Lauder, a quintessentially American brand, to the growing Asian skincare market is to be applauded. If you guessed SK-II Facial Treatment Essence and La Mer Treatment Lotion, give yourself top points. But before I tell you how similar (or different) they are, I’d like to tell you how I feel about this Micro Essence after about a month’s use. I prefer using the latter method because I feel there’s less wastage this way. After about a month, I can attest to nicely hydrated skin. If you have dry skin you will appreciate how well this boosts hydration levels of your skin. If you have oily or combination skin, you too will appreciate how comfortable it feels because as we know, oily and combination skin can be dehydrated too. As we know, when your skin is hydrated, a lot of your skin woes will be solved and skincare will absorb better and work better. However, although this product promises you will see a nice healthy glow to the skin, supple skin, clearer skin and more even toned complexion because it “activates” your skin so it performs and behaves better, I didn’t experience it. This might be due to a couple of factors. I went on to try this after I was using the La Mer The Treatment Lotion and that truly did transform my skin. Perhaps then, my skin was already at its optimum and therefore couldn’t get any better. Perhaps I might have seen a better result had I used this first. Perhaps it just wasn’t as effective for me. I can’t say for sure, but I can attest to it maintaining my skin’s hydration. 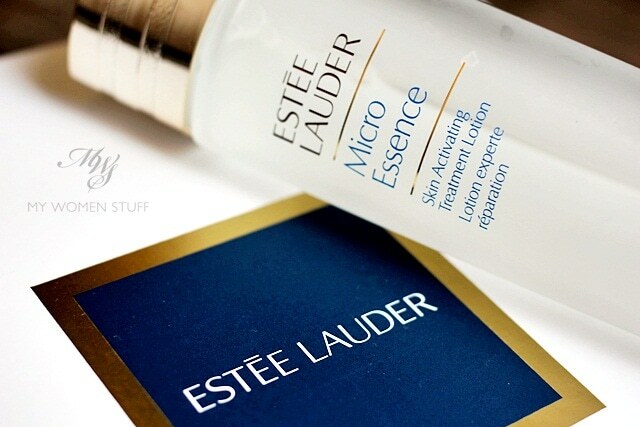 Estee Lauder says that this Micro Essence when paired with their new Advanced Night Repair Synchronised Recovery 2 will make the ANR work even better than on its own. Again, I didn’t notice much of a difference to my skin. ANR2 makes my skin look very rested and that is something I have to thank it for, when I quite literally feel like crap. Adding the Micro Essence helped it absorb just a wee bit better but I didn’t quite notice a marked improvement. Again, it could well be that my skin is already at its optimum so what the Micro Essence is doing, is preserving that optimum level my skin has achieved. 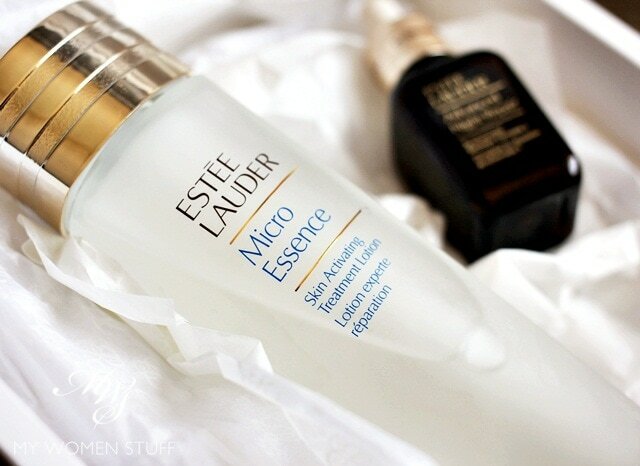 The Estee Lauder Micro Essence Skin Activating Treatment Lotion is a new lotion tailored for the Asian market. What this is, is a light watery lotion that you apply on skin after cleansing and before your serums and moisturiser. It helps to increase the hydration levels of your skin as well as strengthens the skin barrier so skin is healthier and healthy skin glows. I personally experienced the hydration bit but not the glowy bit primarily because I think I’d started using this after already using a similar lotion. So my skin probably was already treated by the time I started Micro Essence so if you haven’t used a similar product then you may noticed a result but if you already use a similar product then you may not. It will depend. I know what some of you are thinking (I read minds don’t ya know? 😉 ). How is this similar or different to the SK2 FTE or the La Mer Treatment Lotion that I raved on about? Well SK-II breaks me out so on that front, it’s a non-starter for me. This EL Micro Essence didn’t break me out so going head to head, I’d pick the EL Micro Essence. Pitting the EL Micro Essence to the La Mer Treatment Lotion, despite the scent, I’m picking the La Mer Treatment Lotion on the grounds simply I prefer the slightly more viscous texture and also because it doesn’t leave a residue on my skin which I do get a wee bit with this EL Micro Essence. There is a bit of a scent in the EL Micro Essence but it isn’t unpleasant nor strong. I personally also feel that the La Mer Treatment Lotion is more hydrating for me so I’ll pick that one. Does this Micro Essence intrigue you? Do you use a similar treatment lotion as part of your skincare routine? Disclosure: Featured product is a press sample for consideration. Our commitment is to an honest and fair review. For posting guidelines please read the disclaimer. LOL Yes indeed! There are a couple out there already but mostly from the Estee Lauder stable. It’s like they picked up SK2 FTE and went crazy with all their brands! Wait! Now im back, may i know why is this not travel friendly? Most welcome Kel 😀 I guessed most people would be wondering about this and no, it isn’t cheap at all! There are some promos going on though I was told where a boatload of deluxe sized samples come with the purchase of a lotion. NOT FAIR hahaha. I want to try this! So, how about that Shiseido one then? The one in the red bottle? Is that the same thing? LOL! Sorry Tracy, this is probably to make up for the N. American only releases that we don’t get 😉 I haven’t tried the Shiseido lotion in the red bottle but I think it has a similar concept. I hear that’s really good too and that it’s endured for over 140 years! I didn’t use any lotions or essences before this, and I noticed great improvements on my skin where hydration is concerned. Because my skin is so hydrated, most of the other imperfections are blurred. Thanks for comparing this with La Mer. I am now very curious – will I see a difference if I used La Mer after this Estee Lauder one? LOL! I am about to redeem a sample of this soon. Will definitely give it a try but it is beyond my budget. I am aiming for ANR II this year which is a better long term investment I would think 🙂 The other day, I was doing a rough calculation on how much I spent on skincare in a year and the figure scared me. Hahaha. Mind you, I have not added ANR II to the equation and the amount is already so high. I guess this is the price we women have to pay for good skin. I don’t see myself picking this up in near future atleast not before trying a sample! its quite expensive from the price point! Aahh…so tempting as I have relatives heading back to KK for.a visit. But it’s expensive. Estee Lauder’s latest sounds interesting.. Will definitely check out the sample. I am presently a total fan of SKII FTE. (Can only afford to splurge on that sole item from SKII) I use the FTE as a toner (the SKII SA balked when I mentioned that – why I ask?) before some serum and then the moisturiser. The Le Mer sample I got was way too smidgen to get a feel of any effect. I must confess, there are moments when I get a bit lost with all the toners, lotions, serums – before the moisturizers, sun block (? ), primer (?) and foundation before the powder.. Help! Brand/item digression – what does Dior’s Dream Skin fit in? saw this via email last night and wondered how different it is compared to SKII and the La Mer lotion u wrote earlier. damn you do read minds ???? babe, if you don’t mind could you share with us the ingredients list to this lotion? very pricey too, no? Guess what, I’ve bought it last Friday! The sample they gave away was a measley 1ml sachet can u beat that? So stingy! Saw a promo pack and couldn’t resist. Ingredients list free of mineral oil and silicones. All’s good!! You’re so bad to the wallet yet u’re so good for the skin… haha ?? Ooh you bought it! I saw the set you put on IG and it was quite a deal. Didn’t know the sample was so measley. How la for people to try? Hey Paris, thanks for the review! I can’t remember if I ever used a similar product, but what it is supposed to do makes it sound very promising! I have no idea if it’ll get here at all, but if it does I’ll at least ask for a sample and see how it works. My skin doesn’t tend to be dehydrated though. I wonder if I’ll really see a difference! Bobbi Brown also debuted a hydration focused treatment lotion under the Extra line in EU/US this winter. Seems to be a bit of an Estee Lauder holdings strategy since BB, La Mer and Estee are owned by the same company. There are lots of similarities in the way they have been launching their premium lines recently. But I guess I can get behind the treatment lotion launches. It is particularly useful to layer under a fine layer of heavy winter moisturiser formulas. 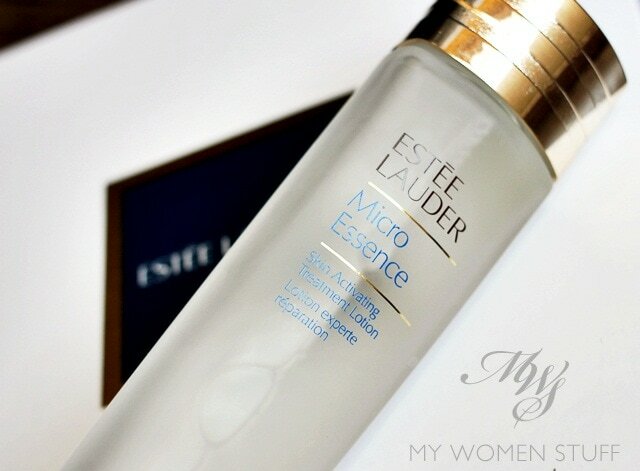 Hi, thank you for the introduction of Micro Essence. Being an Asian, I think a treatment lotion is crucial to me. SK II FTE makes my skin break out as well. I am using Shiseido Ibuki Softening Concentrate which costs RM160 / 75ml, is actually equal to the price of Micro Essence! May consider this product since I am using ANR II. hey have you tried the L\’oreal mask in lotion? 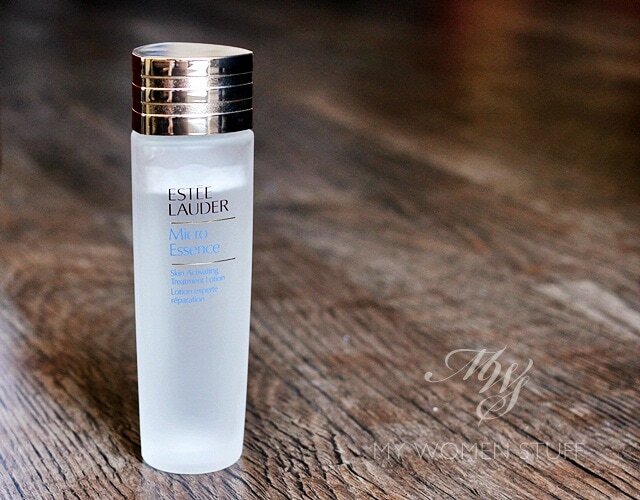 is it any good or comparable to La Mer or Estee Lauder? Hi Valeria, afraid I haven’t tried the L’Oreal one. Didn’t even know it existed! LOL! thanks for the detailed review:) I see that you said the SKII facial essence broke you out so you like the Estee lauder micro essence better, but say IF it did not break you out, how do you compare these two on other aspects and which one would you pick? for example which one make your face better in appearance? clarity? even skin tone? hydration? balancing? calming? etc. Hi Panny, I’m afraid I can’t compare SKII because I used it too long ago when my skin was much more different than it is now, so I won’t be able to measure them against each other I’m afraid. I’m coming from a Twitter convo with Lily and Sunny about this, since I only recently tried this and I think it’s fairly new here in Canada. All I can say is, when I first tried it on my hand: want! And after seeing this review, I have to say that I’ve never been so intrigued about a skincare product before! I guess that’s what it’s like to be a skincare junkie. I asked for a tiny sample at Sephora that I’m gonna use for the next few days and we’ll see if skin likes it!